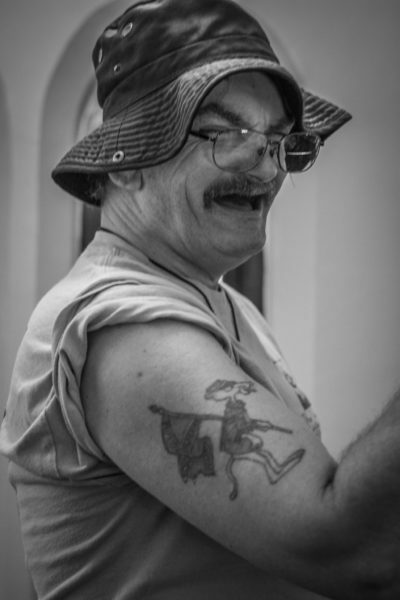 Robert figures he got the bull tattoo right before his social security money started coming in. He knows when he got his first social security check because that money got him to Atlanta for Dale Earnhardt Junior’s seventh championship. “I’ll tell you one thing though. It sure did hurt.” “Well don’t they all?”, I ask. “Not this one.” Robert pulls up his shirt sleeve to reveal another piece—this one of The Pink Panther holding a Confederate flag. “How about you go ahead and tell me that story,” I strongly suggest. I always record these interviews, let them sit for a few days, come back to listen when my head’s cleared out—when the story has had time to simmer and it’s meat can fall a bit easier off the bones. I return to Robert’s story about a week after its collection, go down to the garden, find a bit of solitude at an old picnic table. I listen back to 17 minutes and 37 seconds of recording. I cry and laugh for a total of 25 minutes and 42 seconds. There is the most beautiful juxtaposition to this recording—It is where the rough edges of Robert’s past, meets the softness of his present. It’s where every time he’s knee deep in story about drugs and drag out bar fights, you hear someone walk by and thank him for taking care of the church sanctuary, for making beautiful flower arrangements, or for some other good and kind deed. That kind of intersection is Haywood Street. The alter is prepared by a formerly incarcerated man. Your made-from-scratch meal has been blessed by a single mom in the throws of addiction. The teenage boy who grabs your hand for the recitation of The Lord’s Prayer, is the same hand that brandished an illegal weapon last week. At Haywood Street, folks bring their pasts, plant them into the soil and watch what holy ground can do to even the most severed roots. It’s like Robert has spent enough time in the void of beauty, that he knows its real worth. He understands how pulled weeds, new stone paths and rose filled vases are the stuff of dignity restoration. He is absolutely relentless in the upkeep of God’s house. The bull does not stop until the work is done. Perseverance, Robert. That’s the definition of a Taurus.